When I filed my major three-part report, Chile North to South in 2010, much of my focus was on Chile’s newer regions that could offer conditions suitable for growing Syrah, Sauvignon Blanc, Pinot Noir, Chardonnay, Riesling and other varieties that arguably find their ultimate expression in cooler climates. In Chile’s case this means areas at higher altitudes towards the foothills of the Andes, and it means new areas like Elqui and Limari to the north and Bio Bio to the south of the established central valleys. But most importantly of all perhaps, it means areas closer to Chile’s long Pacific coast, influenced by the cool waters fed from the Antarctic by the Humboldt current. Recently, Chilean producer Santa Rita brought a series of excellent tasting events to London for the wine press and trade that explored various themes, including Chile’s coolest coastal terroirs, from Huasco in the Atacama desert to the north, to Trehuaco towards Chile’s lush lake district in the south. Generously, each tasting included not only wines from their own estates, but examples of the country’s top wines from other producers. Why is cool climate important, and is proximity to the sea an added advantage? Well, the varieties explored here can be classified as ‘aromatic’. Retaining acidity is one benefit of cooler growing conditions, where grapes ripen slowly so that phenolic ripeness (when pips and stems are fully ripe) develops before sugar is too high and acidity drops off. This freshness helps retain complex aromatics and flavours which are not dulled by over ripeness or excessive alcohol. Proximity to the sea often brings with it cool breezes, mist and fog, and it moderates the shifts between day and night temperatures. This figure is multiplied by the number of days in the growing season to give the GDD total. So if the season lasts 100 days, the GDD for that territory is 1250. Note that for vine growers assessing GDD, temperatures above 30ºC are not counted, and the maximum is capped at 30ºC because vines ‘close down’ and fruit does not ripen above this. A chart of Chilean coastal territories shown by viticulturalist Sebastian Labbé was fascinating. It showed, for example, that Lo Abarca, just four kilometres from the coast, accumulates only 1000 degree days per growing season, whereas Casablanca, 30 kilometres from the coast, can claim 1380. Lo Abarca is truly ‘cool climate’, whilst Casablanca might be better described as moderate. By comparison Burgundy accumulates 1172 degree days, Bordeaux 1485. Another important factor is the diurnal range of temperature in any territory (the difference between day and night temperatures). Because fruit is not ripening below 10ºC or above 30ºC, vines in an area like Lo Abarca – with only 11ºC diurnal range – develop differently from those in Casablanca which sees a 16.5ºC diurnal range. Whilst Lo Abarca is cooler in absolute terms, it will see fewer peaks and troughs where growth is retarded. Fifteen wines were presented for tasting, all coming from coastal vineyards that cover the length of Chile’s growing regions. Comparing the latitudes, altitudes, rainfall, temperatures and all important Growing Degree Days and diurnal ranges made for an extremely interesting tasting. It also included some of Chile’s most unusual wines that might well surprise those with a fixed image of the Chilean wine scene. Some of these wines are not available in the UK, but I have given worldwide wine-searcher links for those keen to track any of them down or see indicative prices. Around 1200 GDD, with a diurnal range of 12.3ºC. 13.5% ABV. From granitic soils this is a shimmering, youthful green. Distinctly herbal, not so much grassy as showing asparagus and green bean notes, though a touch of fig and melon skins gives depth. On the palate a huge grapefruity tang of flavour and acidity, it is very dry, the pithy citrus finish relieved by a little oiliness to the texture. See UK stockists on wine-searcher. Around 1100 GDD here, with a diurnal range of 11.6ºC. 12.5% ABV. Paradones is part of the Colchagua Valley, enjoying a cooler average temperature than Leyda and similar granite soils. This is pale, almost transparent yellow/green. It has an icy coolness, but less punchy nose showing some grassiness, but also a sense of minerality. It bursts with flavour on the palate, with a delicious and juicy apple and lemon bite. See UK stockists on wine-searcher. Coolest region of all with 1000 GDD and a diurnal range of 11.3ºC. 14% ABV. Lying quite close to Leyda, but only four kilometres from the Pacific, this vineyard enjoys only 900 degree days per season. Shallow soils on granite. This aged Sauvignon Blanc (from 2003) has a golden hue with primrose yellow at the core. It has some honeyed development, rather oxidised, but nutty and with a certain minerality too. It is very lemony and lean on the palate, and having lost its vitality, is still nervy, steely and I rather enjoyed it (more than others in the room). See UK stockists on wine-searcher. Around 1380 GDD here, with a diurnal range of 16.5ºC. 14.4% ABV. The first of the Chardonnays comes from sandy alluvial soils, where granite and clay make for good drainage but some water retention. It has a pale green-gold colour and gentle toast, hints of ripe fig and of brioche, with some Cox’s pippin nuttiness. On the palate it is dry, the mineral and stony character coming through, with lots of intensity and concentration, but good energy too. See UK stockists on wine-searcher. One of the highest GDD at 1600, diurnal range of 16.1ºC. 14.1% ABV. Again from alluvial terraces with some chalk, and covered in rounded stones. Pale gold, still a hint of green. A bigger wine immediately, with lots of toast, giving a coffeeish character and a real fig and quince richness. Rounder and bigger than the Carmen on the palate, there is real fruit sweetness here, edging into the tropical spectrum, but tangy and juicy too, a real lemon and mineral, typical Limarí freshness in the finish. See UK stockists on wine-searcher. From Huasco, 700 kilometres north of Santiago, with 1250 GDD and a diurnal range of 14.1ºC. 13% ABV. 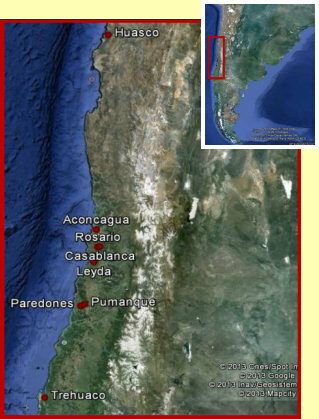 In this desert area there is only 20mm of rainfall per annum – as opposed to over 600mm in Colchagua for example. Who’d have thought that the big Ventisquero operation (Yali being just one of its supermarket labels) would also produce 400 bottles of this wine geek’s delight: foot trodden, aged in small steel barrels, and cloudy and yeasty in its presentation. It’s in the ‘natural wine’ spectrum, with clove and light medicinal notes from the yeastiness, leading onto a palate that is both nutty and dry, and very racy. There’s a limpid weight to the texture, and the finish is strikingly dry and uncompromising. Doesn’t appear to be currently available for sale. High rainfall here (700mm) but still 1250 GDD and 15.3ºC diurnal range. 13% ABV. And to show Chile is definitely not all about playing it safe, is this Chile’s first ‘orange wine’? A natural wine made in 100-year-old clay amphora, it too is cloudy and yeasty, though the powerful Muscat character comes through strongly, the earthy, typically savoury and meaty aromas of natural wines in the background. Quite dry and steely on the palate, this has a hint of sweetness but finishes very dry and quite pithy. I rather liked this, though I confess more for the ‘interesting’ character rather than outright drinkability. Doesn’t appear to be currently available for sale. From granite soils mixed with a little clay, 1200 GDD and a diurnal range of 12.3ºC. 14.1% ABV. This is made in open fermenters, with maturation in oak, one third new. It has a medium ruby/purple colour that is youthful and vivid. Spices and clove at first, quite full on the nose, with lots of juicy kirsch coming through. Lovely sweet fruit on the palate, a medium-bodied texture and again that cherry brightness to the fruit. It is smooth and silky, touched by espresso, with a nice freshness to the finish. A delicious Pinot and a good expression of the grape. See UK stockists on wine-searcher. 1380 GDD with a diurnal range of 16.5ºC. 14% ABV, this comes from further inland and a warmer climate, but quite similar granite hillside soils. A higher proportion of new oak is used. It is more earthy and vegetal, with real Pinot mushroom and truffle. It is big and quite grippy and structured stuff on the palate, spicy, with a firm grip to the tannins and that earthy, vegetal dryness. Quite fine tannins but dry, and a slightly less elegant but good expression of Pinot. See UK stockists on wine-searcher. GDD 1550, diurnal range of 13.5ºC. 14% ABV. This comes from limestone soils with sandy loam, and a vineyard 12 kilometres from the coast that enjoy some cooling fogs, but quite warm as it edges closer to the Atacama. It spends 12 months in French oak. Lovely red fruit character, nice and ripe and open with a hint of strawberry. On the palate leaner in style than the Ocio from Casablanca certainly, more orange to the acidity and a little more angular overall. Enjoyable nevertheless. See UK stockists on wine-searcher. One of the cooler areas of the day with around 1180 degree days here, with a diurnal range of 13.8ºC. 13.5% ABV. Clay and granite soils. Lots of flattering, creamy oak at first here in a deep crimson wine. There is a lovely pepper and game lift too though, and the fruit quite bright with a strawberry pulp character. Big, juicy fruitiness on the palate, loaded with sweet, slick fruit that is quite plush and velvety with ripe tannins and though plenty of dry extract, retains a juicy clarity. See UK stockists on wine-searcher. From vineyards with a ‘big Pacific influence’, GDD 1600, diurnal range of 16.1ºC. 14% ABV. Vineyards planted on alluvial river soils, with clay and stones over chalk. Very dense, opaque crimson colour. Meaty aromatics are dense and savoury, not so aromatically lifted as the Errázuriz, but with a lovely savoury depth. Juicier on the palate, ripe and round but seems just a little too solid and foursquare, with a little leathery aspect in the finish. See UK stockists on wine-searcher. 16ºC diurnal range here, and though no degree days given, “slightly warmer than Leyda”. 14% ABV, from low fertility granite soils. Dramatically dark and saturated colour, and has some violet and pepper lift to its bright, kirsch-like fruit. Very juicy on the palate, but lots of grip too. Racy and savoury, there’s a hint of something herbal and green on the palate, and a big squirt of acidity keeps it racy and savoury into the finish. See UK stockists on wine-searcher. Australian winemaker Brian Croser (who consults for Santa Rita) went on record during the Q and A to say that he thought Pumanque, in eastern Colchagua, would one day be Chile’s most famous terroir. The granite and clay soils see 1512 GDD and a diurnal range of 14.2ºC. 14.3% ABV. This very new area (this vineyard planted 2008) is harvested a month later than in the Alto Maipo for example, and soils are clay and granite. This has a saturated purple colour and such a lovely elegance with its blue/black fruit concentration, dry and Indian inky, but showing lovely glimpses of cherry and sappy character. On the palate deliciously sweet-fruited and fresh, that perfumed nose followed through with energy in the mouth. Perhaps the young vines will give a little more flesh in time, but delightful buoyant stuff. Doesn’t appear to be currently available for sale. Also from Pumanque, 14.8 ABV. Planted in 2007, this is another very young vines wine with a massively deep, saturated colour. It too is inky and youthful on the nose, blue/black fruit again but great thrust and brightness, kirsch and purity to the fore. Racy and fine on the palate it is another delicious wine revelling in the upfront fruit and tannic grip of the young fruit, laden with blackberry crunch, but promising great things. Doesn’t appear to be currently available for sale.